These other teams have variously produced dates for an open summer ocean that, broadly speaking, go out from about 2040 to 2100. But the Monterey researcher believes these models have seriously underestimated some key melting processes. 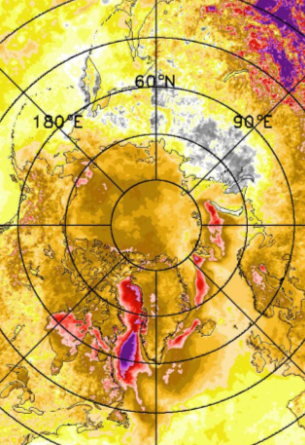 In particular, Professor Maslowski is adamant that models need to incorporate more realistic representations of the way warm water is moving into the Arctic basin from the Pacific and Atlantic oceans. The Intergovernmental Panel on Climate Change (IPCC), the UN-led body which assesses the state of the Earth’s climate system, uses an averaged group of models to forecast ice loss in the Arctic. But it is has become apparent in recent years that the real, observed rate of summer ice melting is now starting to run well ahead of the models. 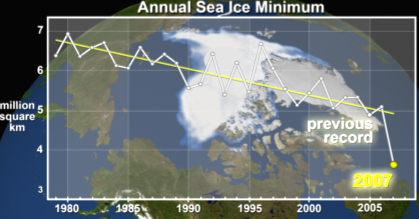 The minimum ice extent reached in September 2007 shattered the previous record for ice withdrawal set in 2005, of 5.32 million square km. The long-term average minimum, based on data from 1979 to 2000, is 6.74 million square km. In comparison, 2007 was lower by 2.61 million square km, an area approximately equal to the size of Alaska and Texas combined, or the size of 10 United Kingdoms. Professor Peter Wadhams from Cambridge University, UK, is an expert on Arctic ice. He has used sonar data collected by Royal Navy submarines to show that the volume loss is outstripping even area withdrawal, which is in agreement with the model result of Professor Maslowski. He cited the ice-albedo feedback effect in which open water receives more solar radiation, which in turn leads to additional warming and further melting. Professor Wadhams said the Arctic was now being set up for further ice loss in the coming years. The US National Snow and Ice Data Center (NSIDC) collects the observational data on the extent of Arctic sea ice, delivering regular status bulletins. Its research scientist Dr Mark Serreze was asked to give one of the main lectures here at this year’s AGU Fall Meeting. Item No. 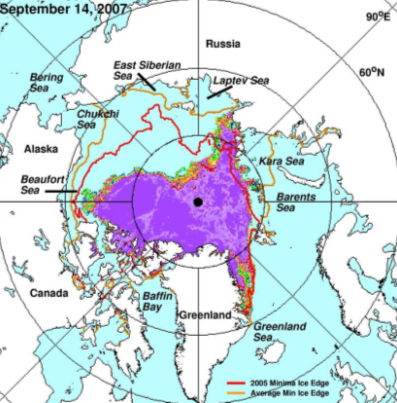 1: The Big Sea-Ice Anomaly in 2007 — At the end of each summer, the sea ice cover reaches its minimum extent. In 2007 that minimum extent was 27 percent less than in 2005, and 38 percent less than average. Item No. 3: Trends in the Arctic Surface Temperature — Trends in the Arctic surface temperature between 1981 and 2007 show surface temperature increases in Greenland, Eurasia and North America. The change can bee seen on this Arctic view. White indicates no temperature change and purple indicates an increase of about 3.6 degrees Fahrenheit (2 degrees Celsius) per decade. This entry was posted on February 5, 2008 at 5:58 pm	and is filed under Uncategorized. Tagged: alberta election, alberta government, climate change, global warming, kyoto, oil sands, tar sands. You can follow any responses to this entry through the RSS 2.0 feed. You can leave a response, or trackback from your own site.